I have really stubby, wimpy lashes. I’ve accepted my lot in life. But it doesn’t mean I don’t try to AMP up these babies in any way that I can! I have a Shu Uemura eyelash curler that many people rave about (I think it’s just ok.) I heard that Shu Uemura curlers were discontinued in the States, and you can only get them here. Anyway, I took the line being discontinued in the US and a desire for a more portable design as an excuse to hunt for another brand. Through Amazon research and reviews, I came across the Japonesque brand and their cute little Go Curl Pocket Curler. The design is so compact, and the open cage prevents your outer lashes from getting pinched. And just like a spare tire, you get an extra pad conveniently placed inside for when you need it (you can see it in the photo underneath the curler). As you can see, I didn’t put mascara on all my eyelashes. I seemed to have missed the lashes closer to my hairline. Oops. It’s so strange to look at so many photos of my eyeballs. I just quickly (and not so thoroughly) swiped on some mascara. But even with that, you can tell a big difference, as in you can actually SEE my lashes. They also plumped and lengthened them. The mascara I used is $19 from Sephora. I will do a review on the Eyeko Mascara later. Here is a BONUS about Japonesque Curlers. Not only do you get the additional pad tucked away in the curler, but you get FREE replacement pads for the life of the curler!! All you do is call 1.800.955.6662 to request them or go online. Isn’t it great? No costs for shipment either. Just comes in an envelope. I got it less than a week from requesting it online. If you’re looking into buying tweezers, Japonesque also has a FREE tweezer reconditioning program if the edges ever get dull. Nice, right? I definitely recommend the Go Curl Pocket Curler. It’s very affordable and puts some OOMPH into the lashes. 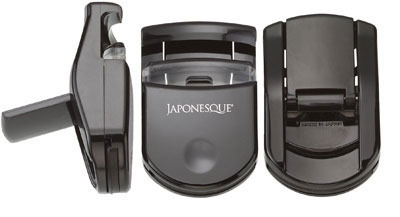 Since I have such barely-there eyelashes, I would love to see what Japonesque curlers do for your lashes! Written by: Erica Cho on August 16, 2012. I have never even heard of this before! I'm usually really scared of eyelash curlers. They have pulled mine out so many times!